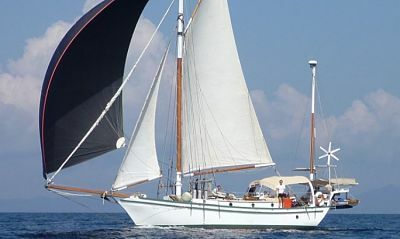 Recreational sailors — both cruisers and racers — know that using sails that match the boat type and rigging and how they are used in varying wind conditions are important factors. Understanding the makeup of sails on board can make a cruise more pleasurable or a race more exciting for the sailboat owner or charterer. Since the beginning of recorded history, sails have been made from cloth, such as flax (linen), hemp, or cotton in its various forms, including canvas. However, 21st century sails are now fabricated from synthetic fibers, ranging from low-cost nylon or polyester to expensive carbon fibers. For years, sails were made from linen, which had poor resistance to rot, UV light, and water absorption. Linen was replaced by cotton during the 19th century and was the fabric of choice in the United States because it was available in large quantities. It was not until the late 20th century that synthetics replaced natural fibers in mainstream use. Different types of cloth are used for different sail types, boats, and the type of sailing. Modern sail fabrics include Dacron, nylon, and laminated fabrics, with almost unlimited variations and combinations. By far, Dacron is the standard sail fabric for cruising mainsails, Genoas, and jibs. It has relatively little stretch, retains its shape over long periods of time and wind ranges, and is mildew resistant. Dacron sails may last up to 10 years, if used infrequently and staying out of big, drawn-out heavy winds. Dacron sails are typically coated with a resin that creates a very stiff and airtight fabric. The resin content in cruising sails is less than in racing sails, making cruising sails softer, easier to handle and stow, and able to absorb more shock. Nylon, which is inherently stretchy and absorbs shock well, is typically used in spinnakers, the baggy, colorful sails used to move a boat with the wind. Nylon has poor ultraviolet (UV) resistance and is not suitable for sails that must hold their shape. Modern laminated sail fabrics combine Mylar or other material that envelop a reinforcing fiber, typically Dacron, Kevlar, or carbon. Laminated fabrics are lighter, stronger, have less stretch and are significantly more expensive than Dacron sails, making them the sail of choice among competitive racing sailors. Speaking of racing, to remain competitive, racing sailors utilize the entire inventory of hybrid or non-Dacron sails and generally, replace racing sails every year. Because these sails take lots of wind loading for extended periods and during all weather conditions, they are not designed for extended (year-to-year) use. Sails are expensive, durable goods and if properly maintained, can have a useful life of 10 or more years, depending on how often they are used and in what conditions. Sail material cost is high and fabrication is labor-intensive, though computers have reduced some of that effort. At some point, cruising and racing sailors will have to contend with a blown sail. A blown sail has stretched to the point that it is no longer efficient on an upwind course, making it difficult to sail and creating a dangerous situation in a building wind. The sailcloth in the middle of the sail becomes so stretched that it causes a “cupping effect.” Instead of generating lift, the wind or gusts in the sail push the boat sideways, making it heel, creating serious huge weather helm issues. Before every voyage, whether for cruising or racing, the condition of all sails should be carefully checked. A typical approach to a sail purchase is to solicit quotes and select the cheapest, not always the best choice. There are reasons some sailmaker services cost more than others; focusing only on cost can have serious safety and performance implications. Consider the type of material, material thread count, and cloth manufacturer. Find a local sailmaker. Proximity can save boatloads of time and money: most sailmakers want to take their own measurements and check details before beginning fabrication. If repairs or alterations are needed, turnaround is much quicker with a local firm than transporting a sail back and forth to a distant sailmaker. Also, determine if the sailmaker is providing answers that are understandable and that suggestions make sense. If using a local sailmaker, the owner should expect the sailmaker to do a “test drive” under sail, in varying conditions. Ask about additional costs for the sailmaker’s time. Communicate the type of boat the sail is for, the type of sail desired, rig dimensions, and budget. A mainsail built for tradewinds sailing is built differently than one for inland cruising. The number of mainsail reefs can impact cost, versatility, and safety. For day sailing, one reef is probably adequate; for coastal/offshore sailing, two are appropriate. Likewise, it is important to consider battens: the type, number, and location of battens can add to sail cost. Ensure that the cost of hardware/fittings is included in a quote, or that costs are itemized if not included. Do not forget the mainsail insignia, numbers, reef ties, and sail bag. Some sailmakers include these items as standard. Tensile Strength: breaking strength. Higher is better for sails. Creep: the long term stretch of a fiber or fabric. A material with creep may have a superior modulus, but can lose its shape over time. Flex Loss: strength lost from bending, folding, or flogging. Thread Count: higher is better. Nylon: A lightweight material with high tensile strength, superior abrasion resistance, and flexibility. However, it has a low modulus, allowing too much stretch for upwind sails. Nylon is susceptible to UV and chemical degradation, and its properties can change due to moisture absorption. Polyester (Dacron): The most common type of sailcloth, typically known as Dacron, with excellent resiliency, high abrasion and UV resistance, high flex strength, and low cost. Low absorbency allows the fiber to dry quickly. Kevlar: The predominant fiber for racing sails, Kevlar is stronger, has a higher strength-to-weight ratio than steel, and a higher modulus than Dacron. It loses its strength with flexing, folding, and flogging, and does not resist UV light well. Spectra: An ultra-high, molecular-weight polyethylene with high UV resistance, high initial modulus, high flex strength, and superior breaking strength. Over time, Spectra is susceptible to elongation under sustained loads, which changes its shape. Due to the potential for shape change, the material is typically used for spinnakers on high performance boats. Dyneema: Similar to Spectra, Dyneema is extremely strong and growing in popularity. Dyneema combines a high strength-to-weight ratio with excellent low stretch and abrasion and UV resistance qualities. Mylar: A polyester film made from polyethylene terephthalate. Typically, Mylar is laminated into sailcloth and provides high tensile strength, dimensional stability, and transparency. Mylar is used extensively in racing sails. Carbon Fiber: A high modulus fiber made from carbon, virtually unaffected by UV exposure with exceptional low stretch. Carbon fiber sails are extremely durable and flexible, but costly. Buying a new sail is a major investment — many details should be considered before purchasing. A custom-built sail that works together with the vessel and the type of sailing are important issues. Taking time to find out what is available and being informed can enhance the sailing experience, whether for a day sail, an extended cruise, or a competitive regatta. After all, enjoyment is what sailing is all about!